As Catholic parents it is your privilege and responsibility to have your child baptized. If you would like to have your child baptized here at St. Therese, please contact the Rectory at 216-581-2852 to register for the parent/godparent workshop. The workshop can be taken before or after the birth of your child. As required by Church Law: the people you choose to be godparents for your child must be practicing Catholics, have completed all three of the sacraments of initiation (Baptism, Eucharist and Confirmation), and be in good standing with the Church (including, if married, married in the Roman Catholic Church). The godparents will need to go to the parish at which they are registered and ask for a certificate affirming that all of the above is true. Please contact the rectory to schedule your child's baptism at 216-581-2852. Reconciliation and Eucharist usually take place when the students are in the second grade. Here at St. Therese the preparation is as much as possible, a family event. Parental involvement includes participation in meetings, completing the assigned projects and material with their child and bringing the children to the student sessions. They are also asked to make sure that they and the students attend Mass each weekend and take some time to discuss with their child/children the children's bulletin, the readings or other mass-related matters. If you have questions, contact our Director of Religious Education, Nancy Heineke, at 216-581-2852 or email to [email protected]. The sacrament of Confirmation usually takes place when the young people are in the eighth grade. A candidate for the sacrament must have completed the first two of the sacraments of initiation and have attended at least one full year of religious instruction prior to applying for Confirmation. As with the other sacraments, there is a certain amount of family participation. The students themselves are asked to complete both academic requirements and service related involvement. They will be asked to attend classes and workshops and to participate in the Holy Sacrifice of the Mass each week. If there are any adults in the parish who, for whatever reason, have not had the opportunity to receive the sacrament of Confirmation. There are separate classes for adults. To be a sponsor for Confirmation, one must be a registered member of a parish, have completed the sacraments of initiation and be a participating member of the Church. They must also have the willingness to "walk with" the person to be confirmed during the time of preparation. If you have any further question, please contact our Director of Religious Education, Nancy Heineke, at 216-581-2852 or email to [email protected]. Congratulations on your engagement! We are happy that you have chosen to celebrate your marriage as a sacred commitment to each other in Christ. When a couple makes arrangements with the Church regarding their wedding, they are asking much more of the Church than merely providing a sacred ceremony - the couple is asking the Church to get involved in their married life. They are seeking the Church's help in preparing them for a crucial sacrament. Our goal is that each person entering marriage is prepared to receive this sacrament fully aware of its meaning and open to its graces. With this in mind, the following is provided to help couples know what is expected of them as they prepare for the celebration of marriage at St. Therese. Marriage preparation is very important, since no one is born knowing how to live out the vocation of marriage. The purpose of the preparation process is to help you to talk about the dynamics of marriage, including your shared spiritual life, children, sexuality, finances, your families of origin, etc. By diocesan regulation, this process is to begin at least six months before the wedding. A year is much preferred, so that you are less likely to become distracted by the details of planning for the wedding. Please understand that, while the parish will tentatively reserve the date you request for your wedding, it remains tentative until the priest or deacon has met with you and found that no major impediments to marriage exist. We use the Prepare/Enrich Program as we work with the engaged couple. The couple is asked to pay the $26.95 cost for this. In addition to the priest's or deacon's meetings with the couple, by diocesan requirement, they must attend an Engaged Encounter Weekend or a Pre-Cana Day. The schedule, location, and cost for either one may be found by visiting the diocesan website: www.clevelandcatholiccharities.org/mfm. Also, the U.S. bishops have a fine website for engaged and married couples: www.foryourmarriage.org. Please contact the rectory (216-581-2852) to speak with Father John or Deacon Bob to schedule your upcoming wedding. Again, congratulations! A textbook is used to ensure the basic doctrine is covered. Sacramental Programs are offered at the appropriated grade levels. For more information, contact our Director of Religious Education, Nancy Heineke, at 216-581-2852. 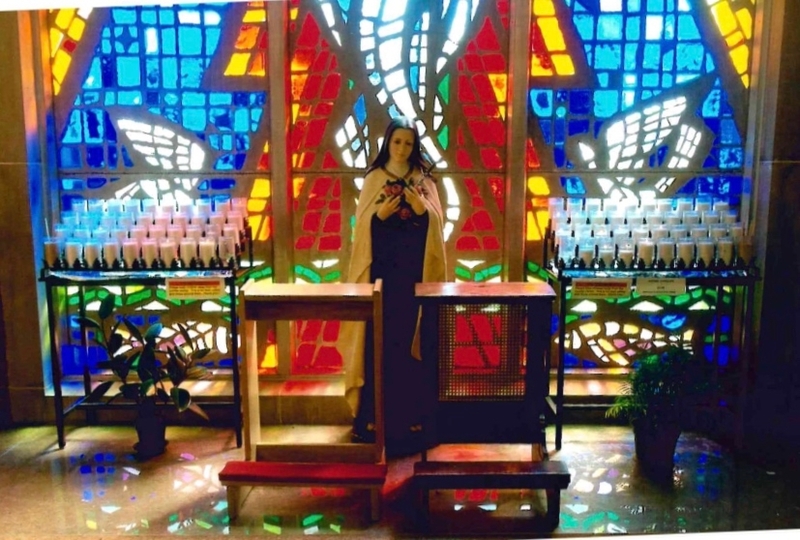 If you or someone you know is interested in receiving the sacraments to participate more fully during Mass or to become part of the instruction team call the Rectory at 216-581-2852. This ministry reaches out to those in our parish who are unable to come to Mass because of illness or some other circumstance. It is an important way to keep our homebound and ill parishioners connected to the community. -Ministers visit parishioners at their homes, and those who are at Marymount Hospital, Marymount Place and Villa St. Joseph all located on the same campus. -Eucharistic Ministers make homebound visits and visits to those living at Marymount Place and Villa St. Joseph. Others interested in visiting those in the hospital are needed also, but do not necessarily need to be Eucharistic Ministers. -Visits are made weekly, every two weeks and monthly, depending on the needs of the parishioner. Schedules can be flexible. This is a great opportunity for families, couples, and individuals to reach out in a real way to those in our parish and to be involved in a ministry that responds to our call to care for one another. For more information, contact 216-581-2852. For more information, contact Frank Kozuch 440-582-8552.